Red heels are tricky bastards. They're my conundrum, the enigma of my style files, the bane of my closet's existence. And yet, we must effectively co-exist. They're just too damn dominant in the fashion chain to ignore. I tried my hand at them once before with these beautiful, red, strappy Charles David heels that were probably better reserved for weddings and catered events, or so I thought. And so they sat there, never seeing the light of days or glam red carpets, collecting dust until I finally gave them to a more qualified girl's closet they deserved. I do wish I had tried harder with them. But now I'm giving myself a second chance with these red Kelsi Dagger heels I just couldn't click away from on Lulu*s. Even with these in my hands, I still had no idea how to not put them through the same fate as my departed Charles Davids. So naturally, I took to twitter to ask my fashionable friends for their advice on how to style red heels on the glam side (we know how easily they can fall to the tramp side, tricky I tell you!). There were so many great suggestions, I'm going to share three ways to wear these red statement heels this week. For the first look, I re-interpreted my bestie Chanelle's tip to wear these with jeans and a white tee, the classic ensemble for dressing down heels. I went for my favorite boyfriend jeans from AG to take the edge off the shoes, but to keep them still in the spotlight, I counted on my Choies shirt with the red stripe accent to make the reds in the outfit burst out. I never knew how fun red heels can actually be! It's a reminder that the color red is definitely one of those you have to ease your way into, just like how we are once hesitant to try the red lip. Though when we do, we wear it like we were crazy to not have tried it sooner. Come back this week to check out the second and third ways I'll be styling these Kelsi Dagger heels! I must say it is not the classic look for red heels indeed! But I am honestly inlove with the styling, a bit extraordinary, but still perfect! 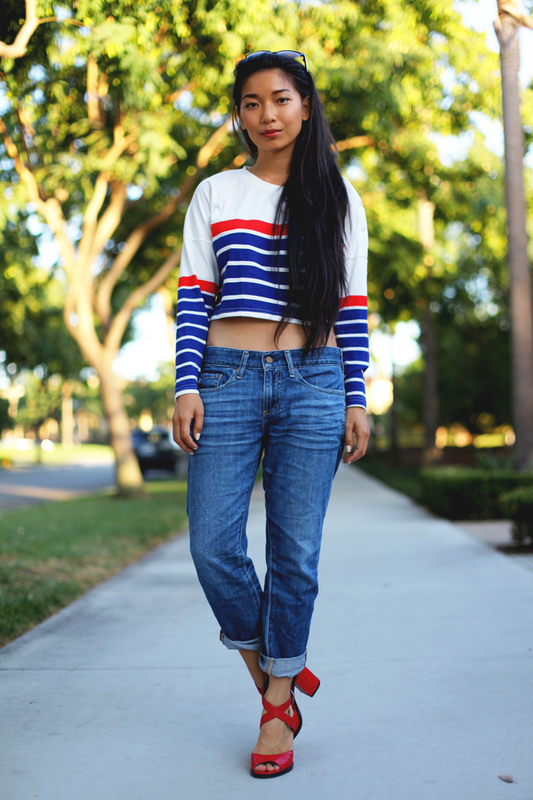 Super cool & laidback outfit, love it! Loving those heels!